40/1 shot Domesday Book provided trainer Stuart Edmunds with his first Cheltenham Festival winner after staying on strongly under jockey Gina Andrews to claim the concluding race on day three. In a thrilling finish, the seven-year-old son of Street Cry got up in the closing stages to claim victory by three-quarters of a length from Pendra (16/1). Nicky Henderson's Premier Bond was a further three-quarters of a length back in third, with another length to Potters Legend, trained by Lucy Wadham, in fourth. Newport Pagnell handler Edmunds said: "Watching his other races, he has always been a horse that's travelled a bit behind the bridle if he hasn't got his own way but he battled today. "Gina particularly suited him as she can be forceful. She made her mind up for him at his fences. "It's amazing to have my first Cheltenham Festival winner. It's in a different league. I had a winner at the track with Wolf Of Windlesham but this is completely different. It's great." Domesday Book gave jockey Gina Andrews a first Festival victory, overpowering top-weight Pendra by three-quarters of a length on the run-in. The 40/1 chance is trained by Stuart Edmunds and was bred by The Queen. 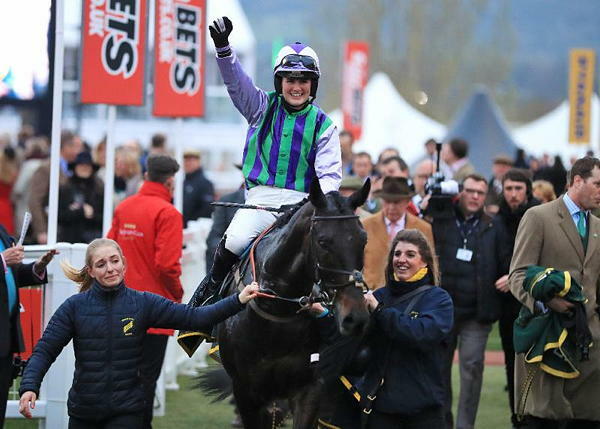 Andrews, 25, who has ridden around 200 winners under Rules and in point-to-points and who runs a yard with her husband Tom Ellis in Warwickshire, said: "It has been my lifetime ambition just to ride at The Festival, let alone ride a winner here. "The first thing Stuart said to me was the horse would never be on the bridle, but to be honest he was never off it until I turned in, so it was a pleasant surprise. He gave me a great ride and travelled well. He rallied well on the run-in as well. "Jumping the last I didn't think I'd win, although I had thought I might jumping two out, but he rallied again, and he had the loose horse to help him. Normally you are willing the line to come to you, but I was willing it away so I could get to it. I'm delighted. "The girls said to me when I left home this morning that if I won, they'd have a party organised for when I got back, so I'm coming!" Andrews' victory means that female jockeys have won both of the races for amateur riders run so far at The Festival 2017 - Lisa O'Neill took the J T McNamara National Hunt Chase on Tiger Roll for Gordon Elliott on Tuesday.